LAS VEGAS (Friday, January 24, 2014) – The National Thoroughbred Racing Association (NTRA) announced today that Daily Racing Form, title sponsor of the DRF/NTRA National Handicapping Championship since its inception, is expanding its sponsorship activation nationally and on-site for this weekend’s 15th renewal of the world’s most prestigious handicapping contest. The event runs Friday to Sunday at Treasure Island Las Vegas. Daily Racing Form provides complete live NHC coverage on DRF.com’s “NHC 15” event page. Visitors to the site will find a real-time stream of posts and pictures, related news, videos and interviews offering an unprecedented level of engagement for players both in Las Vegas and those following along at home. NHC contestants can contribute their posts to the ScribbleLive feature using #NHC15. Through its NHCQualify.com site, Daily Racing Form debuts the “Play Along with the NHC” contest, offering players at home the chance to win a share of up to $13,500. 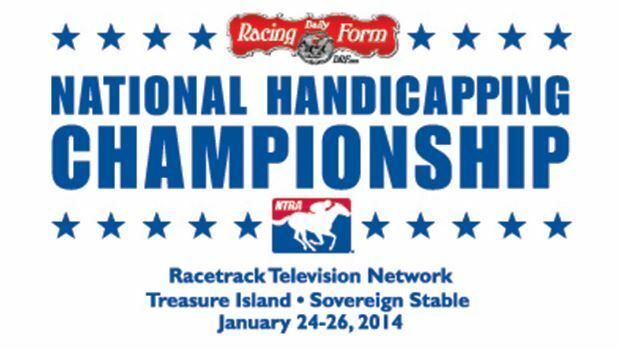 Entrants will wager and compete this Saturday on the same eight mandatory races featured in Day 2 of the NHC. Registration for the handicapping contest is limited to the first 500 people via NHCQualify.com and costs $50 to enter. To register or to get more details, visit NHCQualify.com. NHCQualify.com will launch the “2014 NHCQualify Giveaway” offering players the chance to enter to win one of 15 prizes when playing on NHCQualify in February and March. Prizes include free entries into an upcoming NHCQ tournament, $100 DRF Bets cash bonuses, and $50 DRF.com gift cards. Details will be available at NHCQualify.com. Daily Racing Form, “America’s Turf Authority since 1894″ for Thoroughbred racing horseplayers and professionals throughout North America, is the Thoroughbred industry’s dominant multi-channel media company. Launched in 1894, Daily Racing Form is the only daily newspaper in the U.S. dedicated solely to the coverage of a single sport, publishing up to 2,000 unique pages of statistical and editorial copy every day, in as many as 20 daily editions, 364 days a year. Its companion website, www.DRF.com, is the most heavily-trafficked horseracing destination, providing players with the most extensive news coverage in racing, interactive past performances, exclusive handicapping tools, and access to DRF Bets™, America’s fastest growing online and mobile wagering platform. Additionally, Daily Racing Form publishes DRF Harness Eye, the daily newspaper and digital content for Standardbred racing since 1964, offering news, handicapping products, and online wagering functionality specifically for Harness players. In 2012, Daily Racing Form introduced DRF Breeding, a business dedicated to serving Breeders and Owners, bringing expanded coverage and tools to horseplayer and breeding enthusiasts alike.